(3) Mp3 files with just the underscoring. As is suggested below in the fine print, you may simply right click on any of these links and choose Save Target As... to download the file. If you choose do this, you may listen on your computer, or burn the mp3(s) to a compact disc, or save them to an iPod or any mp3 player. (1) Print the Adobe PDF with the printed narration. Take note of the time stamps (in blue) to the right of some of the lines. (2) Click on the mp3 with the spoken narration, and follow along with the printed narration. As you listen, you will notice that the blue time stamps serve as reference points for the places in the mp3 where those lines begin. This will help to familiarize you with the music that will be playing as you speak certain lines of text. (3) Now, click on the mp3 with just the underscoring (no spoken narration included). Using the time stamps (in blue), speak the monologue, aligning up these lines of narration with the time shown as the mp3 plays. It is not essential to be absolutely perfect in this, but getting the pacing right so that one is near these reference points helps the conductor and the musicians tremendously. Once you realize your tendencies with certain lines of text, words like "slower" and "faster" written next to lines of text will help you to recall in the performance what you need to do to get the text to synchronize well with the music. 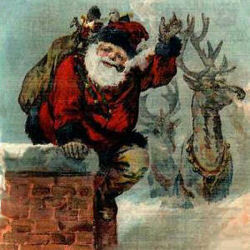 See/Print the narration 'Twas the Night Before Christmas, with reference times*. Hear a computer generated version of 'Twas the Night Before Christmas, with narration [brass band version]*. Hear a computer generated version of 'Twas the Night Before Christmas, without narration [brass band version]*. *Right click on the link and choose Save Target As... to download the file.